One of the major issues in cultural psychology is how to take diversity seriously while also acknowledging our shared humanity. This collection brings together leading figures in the field of cultural psychology to consider that question, addressing the complex issues that underpin the interconnections between culture and the human mind. 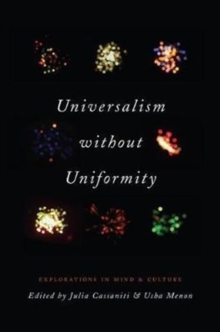 The contributors to Universalism without Uniformity make two fundamental points: first, that as humans we are motivated to find meaning in everything around us; and, second, that the cultural worlds we live in are constituted by our involvement in them. Therefore, we exist as human beings specifically because we interpret and make sense of the events and experiences of our lives and we do so using the meanings and resources we draw from the cultural worlds that we have created through our thoughts and actions. Offering empirically driven research that takes psychological diversity seriously, Universalism without Uniformity breaks new ground in the interdisciplinary study of culture and mind.